Short Lightning 8 pin Extension Cable (Male to Female, Video & Audio Compatible) for iPhones / iPads 8 Pin Male to Female Extension Cable Cord for iPhone 6 / iPhone 6 plus / iPad Air 2 / iPad Mini 2 / iPod Touches / Music Dock [AP003702] - $3.95 : allputer.com - Accessories for all your Portable Electronics & Computers! - You can use it to charge your iPhones / iPad Airs / iPad Minis / iPod Touches / iPod Nanos, and transfer data, sync via other function cables. 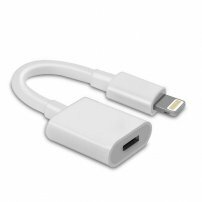 - any iDevices using 8-pin lightning connector and any devices with a 8-pin male connector for connecting to iDevice. - Not recommended to use this adapter for charging, as it will take it longer comparing to the situation without this cable. - If you plug the extender cable into the iPhone first (male end of cable into iPhone, female end not connected), it will be detected as an OEM cable and come to a message and that it may not work. If you plug it into the device first (connect the female end first), and then plug the male end into the iPhone, it will work as desired and will not prompt you a message. However, if there is really such message, just cancel it. - Length: Approx. 10 cm (or 4 inches) approx.